With names like the Black Aces and Black Mafia and a logo featuring a smiling dude with sunglasses and an afro, you knew that these teams were going to be just a little different. But different was what the Skillz Black Aces and Black Mafia were all about. 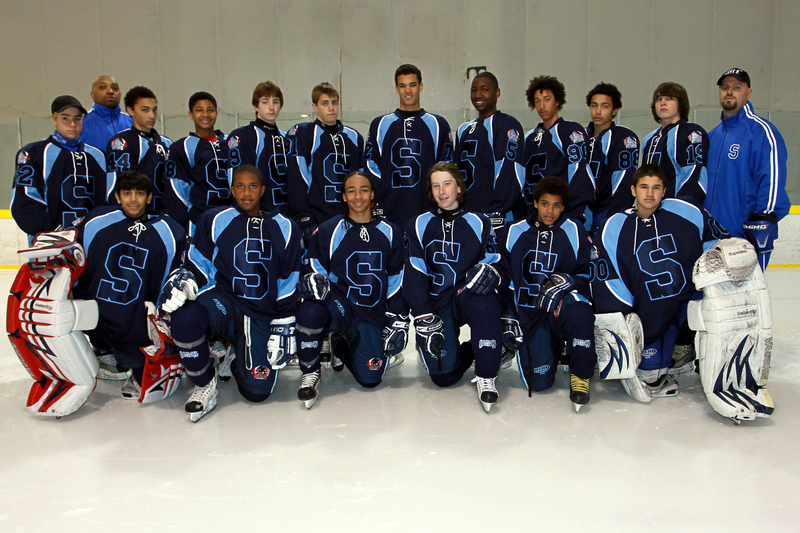 The early squads were Toronto-based summer youth hockey teams comprised of elite, National Hockey League draft-eligible players born in 1995 and 1996 – and almost all of them black. The teams barnstormed summer hockey tournaments in the United States and Canada and consistently dominated opponents with their speed and skill. “It was probably one of the coolest things I’ve ever done in my life,” said Windsor Spitfires forward Josh Ho-Sang, who skated for four summers with the Skillz teams before joining the Ontario Hockey League franchise. His father, Wayne Ho-Sang also served as a team coach. Skillz Black Aces Coach Cyril Bollers, rear left, and his 2010 team. The Black Aces and Black Mafia alumni reads like a page from “Who’s Who Among Up-And-Coming Hockey Players”: Sault Ste. Marie Greyhounds defenseman Darnell Nurse, the Edmonton Oilers’ 2013 first-round pick last summer; Kitchener Rangers forward Justin Bailey, a Buffalo Sabres second-round pick; forward Stephen Harper of the Erie Otters; and Bellville Bulls defenseman Jordan Subban, the Vancouver Canucks’ fourth-round pick and the younger brother of Montreal Canadiens defenseman P.K. Subban and Boston Bruins goaltending prospect Malcolm Subban. And players hoping to hear NHL Commissioner Gary Bettman call their name at next summer’s draft in Philadelphia includes forwards Ho-Sang, Jeremiah Addison of the Saginaw Spirit, Jaden Lindo of the Owen Sound Attack, Keegan Iverson of the Portland Winterhawks, and Cordell James and defenseman C.J. Garcia of the Barrie Colts. 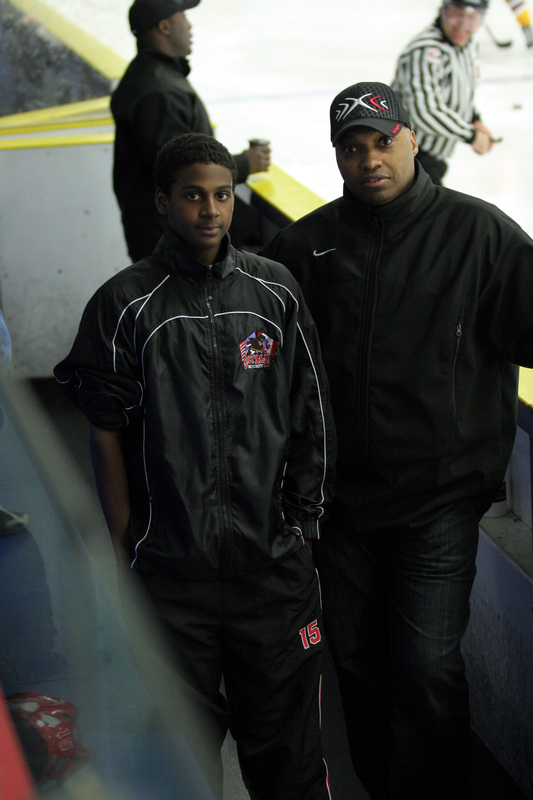 Coach Cyril Bollers, right, with Josh Burnside, who now plays for the OHL Mississauga Steelheads. Like his players, Skillz President and Coach Cyril Bollers has professional hockey dreams. He hopes the progress of his players – along with him obtaining the requisite certifications, credentials, and experience – will lead to a coaching job behind the bench of a major junior, American Hockey League or NHL team. The success of Bollers’ summer teams over the years has attracted the attention of the broader hockey community to the point that the squads are no longer just a black thing. White players like Brendan Lemieux, a Barrie Colts left wing and son of retired NHL agitator supreme Claude Lemieux, and Chad Hefferman, a Bellville Bulls left winger and stepson of former Chicago Blackhawks and New York Rangers sniper Steve Larmer, have played for Bollers. Bollers teams are a legacy of a Skillz hockey program that was created to give minority and disadvantaged Canadian youth the exposure and the opportunity to play the expensive sport of hockey. The program helped produce a talented crop of NHL players: Joel Ward of the Washington Capitals; Chris Stewart of the St. Louis Blues; Wayne Simmonds of the Philadelphia Flyers; and retired NHLers Anson Carter, Jamal Mayers, and Hockey Night in Canada/NBC Sports Network/NHL Network’s Kevin Weekes, who went on to help underwrite Skillz. In the years that followed, Bollers added the competitive summer teams to the program. The initial squads wore their ethnicity with pride – and with a purpose. Racial attitudes have come a long way since Fred Sasakamoose became the NHL’s first Native/First Nation player during the 1953-54 season and Willie O’Ree became the league’s first black player in 1958. Barrie’s C.J. Garcia, a Black Aces alum (Terry Wilson Photography). fans, teammates, opposing players, coaches, and on-ice officials – from youth hockey to the professional ranks. Look no further than the torrent of racist emails from so-called Bruins fans after Ward scored a Game 7 overtime goal that vanquished Boston from the 2012 Stanley Cup playoffs. Or the Flyers-Detroit Red Wings 2011 preseason game in London, Ont., where an alleged fan threw a banana towards Simmonds during a shootout. “People don’t understand what our guys go through, they don’t get it, even I don’t truly get what these guys go through,” said Amy Iverson, Keegan Iverson’s mother. The Skillz elite teams offer is a change of pace for young players of color: a respite from being the only one on the team or the player who has to conform to a locker room culture where country and rock music are often rule, Bollers said. Justin Bailey of OHL Kitchener played for Bollers. (Kitchener Rangers). And how did the predominately black teams go over with opposing players and fans? But Karen Buscaglia, Justin Bailey’s mother, recalled that the Black Mafia name was too much for one opposing parent. He angrily removed the name from the board at a tournament, she said. Portland’s Keegan Iverson, a Black Aces alum (Brian Heim/Portland Winterhawks). The “Black Aces” moniker has a rich hockey history. In the 1940s, former Bruins great Eddie Shore owned the minor league Springfield Indians and used the name to describe players who were trying to work their way back from injury or out of the doghouse. The name was also given to the famous all-black 1940s hockey line of the Sherbrooke Saints that featured Herb Carnegie – regarded by many as the greatest player never to play in the NHL – brother Ossie Carnegie and Manny McIntyre. Skillz players and parents describe Bollers, 44, as one part Hockey Hall of Fame Coach Scotty Bowman, one part NFL Hall of Fame Coach Vince Lombardi, and one part Sunday preacher. He instills in his players a hockey tactician’s knowledge, the X’s and O’s of the game. He’s a demanding, no-nonsense task-master who is quick to reward fine play and quick to punish poor performance with a seat on the bench. He’s a fiery motivational speaker a la televangelists T.D. Jakes or Joel Osteen. 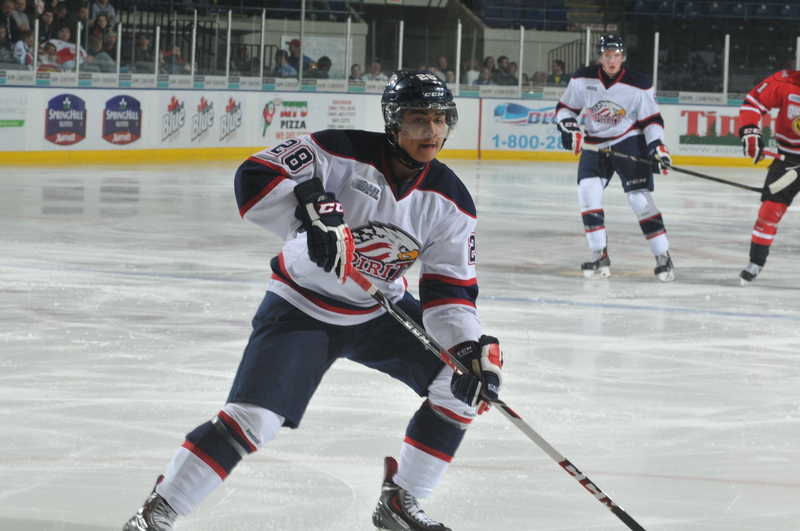 OHL Windsor’s Josh Ho-Sang skating for the Black Aces. When Keegan Iverson saw how much the fun Black Aces were having during a tournament in Toronto about four summers ago, he desperately wanted to join the team. When he received an invite from Bollers, Iverson’s mother packed the family into the car the following summer and made a two-day trek from Minnesota to join the Bollers’ team at a tournament in Upstate New York. To learn more about the Skillz Black Aces and Black Mafia visit www.skillzhockey.com. Thanks for finding and reading the site!